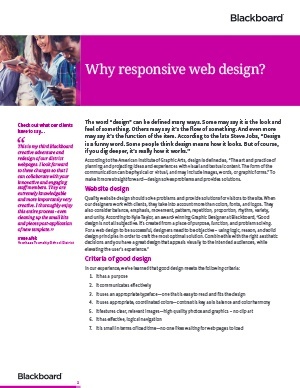 Why does your district need responsive web design? More than 50% of all website visits come from a mobile device. A great mobile user experience is critical if you want your visitors to find the information they need from your websites. Blackboard's creative services team has been leveraging responsive web design (RWD) since 2012 so K-12 districts and schools can present their website information attractively on every device, including smartphones and tablets. Discover how responsive web design can benefit your district by downloading this whitepaper today.